In order to handle the enormous amount of specialty items such as floatant, indicators, tippet, etc. that are associated with fly fishing, a quality fishing vest is an investment in making your life on the river organized and trouble free. The cost of fishing vests are competitively close so understanding what makes one vest better than the next is important so you can get the most for your money. 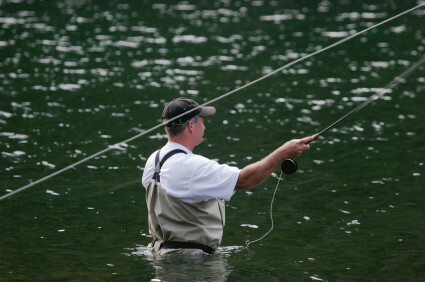 Many different styles and varieties of fly-fishing vests are available to the avid angler. Each of the different vests has been designed to meet all the various streamside needs of individuals like yourself. The four different groups are standard fabric fly fishing vests, mesh fly fishing vests, chest fishing vests and waist fishing vests. Standard Fabric Fly Fishing Vests - This is the standard fly fishing vest among most anglers. They have lots of pockets with lots of room and are a good idea for any fishing situation. Mesh Fly Fishing Vests - This vest is just a variation of the standard fly fishing vest. The mesh vest has just as much room as the standard vest but due to it unique mesh construction it is a little cooler and better suited for the hot days of summer. Chest Fishing Vests - The chest pack is a specialized type of fly fishing vest which has a few small compartments along with one very large front chest pocket. Due to the compact nature of these chest vests, they make ideal small stream or overgrown river packs. Waist Fishing Vests - The waist vest is a recent addition to the fly fishing scene. Small and compact, these waist vests are perfect for the more seasoned angler who knows exactly what he does and does not need out on the water. The major principal behind wearing a fishing vest is to hold all the fly-fishing necessities that you might possibly need in a day�s worth of fishing. That being said, there are many different items that you could potentially bring with you on any day of fishing. So having a vest that contains a good number of pockets is one of the features that you should keep an eye out for when looking at vests. A good number is not a ridiculous one such as 50, but more around 15-25. Another key feature to look for when buying a vest is the different pockets sizes included with the vest. Having a vest with just large pockets will make neatly storing and finding little items impossible, while on the other hand a vest that has only little pockets will be no good for carrying large fly boxes. The best idea is to try and find a vest that has a few large pockets (4-6) with additional varied sized small pockets and one very large back stow-away space. Most importantly find a fly fishing vest that you know will suit you best.